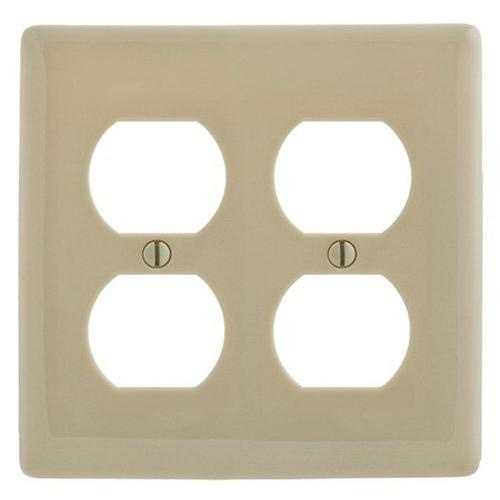 Hubbell-Wiring HomeSelect® Standard size 2-Gang square wallplate in ivory color, has nylon construction and smooth finish. It measures 4.69-Inch x 4.63-Inch. Wallplate has two duplex receptacle configuration. It is ideal for protection against contact of live terminals and wiring. Wallplate is screw mountable. It offers high resistance to solvents and cleaning solutions, providing long life in the harshest environments. Reinforcement ribs ensure better strength. Wallplate comes with 6/32-Inch x 3/8-Inch painted oval milled head mounting screws for quick and easy installation. Wallplate is UL listed, CSA certified and RoHS compliant.